This contest is now over, but you can view all of the entries below. Your cakes are special! They make people happy, are beautiful AND taste delicious! Give one of your creations the attention it truly deserves! Write about it! ALL the juicy details. Be as CREATIVE as you wish. Your Passion is what is most important when sharing. We appreciate your joining in :-) Anyone who makes cakes can join in whether you do it from home for fun or as a small business. A non profit volunteer based organization that connects families with children suffering from critical illness. Volunteer bakers all around the world bake dream cakes for the child and or a family member bringing smiles to so many little faces. #1. First make your donation of at least $10.00 per entry. You can enter as many times as you like. You can donate as much as you like. Please help by either donating to this cause and entering your creations, spreading the word about this event, or simply make a donation. You do not need a Pay Pal account to use the Donate button. 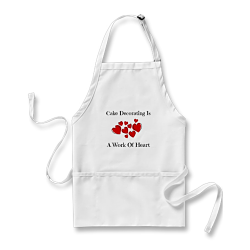 THANK YOU :-) All proceeds go to Icing Smiles. Receive as many comments as possible to win the prize and help spread the word about this important event and organization. 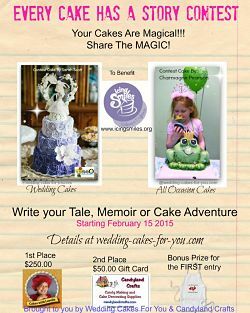 HIGHLY RECOMMENDED: Read some of the entries below from the 2013 cake decorating contest fundraiser and the newer ones form this contest to get an idea of what a page should generally look like. Each story is unique. There are no rules about what you write. Just have fun and speak from the heart!!! The only rule is the story needs to be at least 300 words to be accepted. If you should have any questions or problems uploading photos I can be reached very easily by email through the Contact page. Thanks again for taking the time to join in and keep the smiles going. 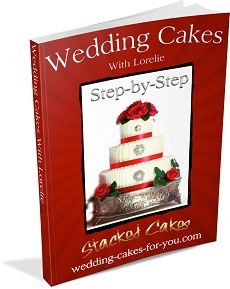 What is YOUR Cake Story? IMPORTANT: The content of your story is a very important part of the contest.. Please don't skimp on this part. We want to hear ALL the Yummy details. 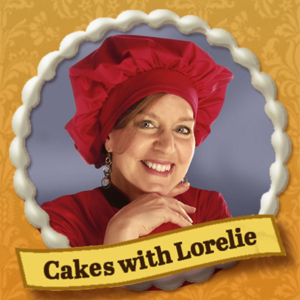 Your unique cake story will appear on a Web page mostly as you enter it here. Wedding Cakes For You will add some titles and edit somewhat if needed. IMPORTANT Your story must be original and cannot be copied from another source, including your blog if you have one. Google will penalize both of us for duplicate content. Great! NOTE: Your photos must be original of a cake that YOU made and cannot be copied from another source. Click the Browse button and find the first photo on your computer. Select it and click on the button to choose it. If your photo does not upload than you may need to re-size it. If you need help re-sizing please email me the photos and I will be glad to do it for you. cpastrychef@gmail.com or use Picmonkey.com or Paint if you have it on your computer. Re-size the photos to no larger than 800 pixels wide. Click below to see the beautiful cakes and stories. The winners will be chosen by the number of comments they receive. The IP address can and will be checked for all of the comments to assure that the same person does not repeatedly comment. Thank You to all of the 2013 contestants who donated to Icing Smiles and took the time to tell all of your wonderful stories. "The people you reached through the promotion of the contest is immeasurable! And we thank you for your support and going above and beyond to put together this contest!" Development Manager Icing Smiles, Inc.